Hooks Ranch is a value in today’s market for working ranches in the desirable Yellowstone River Valley. The ranch is easily accessed by Montana’s leading transportation and retail centers and offers a broad range of exceptional recreational opportunities both on and nearby the ranch, in a beautiful area of southern Montana surrounded by towering peaks and trout-filled river courses. The Hooks Ranch compound and its distinctive red barn bearing the Hooks Ranch name is located south of Interstate 90 just 29 miles east of the town of Big Timber. The ranch’s 4,050± acres (3,410± deeded and 640± state lease) lie in the Schoolhouse Creek drainage and are predominantly productive rangeland, which benefits from the area’s higher than average precipitation. The ranch has a full array of working facilities which complement the two-story, four-bedroom ranch home, and support a 160-head cattle operation. The ranch also has 214± acres classified as forest according to Montana tax records, and these pockets of evergreens located in the draws and north facing slopes provide diversity to the landscape as well as habitat for elk and other game animals. The distant views of the Beartooth Front to the southwest and the Crazy Mountain Range to the northwest provide a dramatic, often snowcapped, backdrop to the rolling landscape. Hooks Ranch offers a viable livestock operation and strong wildlife amenities, with convenient access to Billings, Bozeman, and the smaller communities of Big Timber and Columbus along the Yellowstone River Valley. The Hooks Ranch is a landmark along the Yellowstone corridor due to its recognizable red ranch buildings located on the south side of Interstate 90. A ranch access exit off the interstate leads to the ranch headquarters, which include a four-bedroom home, shop, horse barn, calving barn, corrals, and additional storage buildings. From there the ranch spans approximately three miles south and four miles west along the Schoolhouse Creek drainage. The topography is primarily rolling with a variety of open grassland, dryland hay or improved pasture, and timbered coulees and draws. From the hilltops the views are expansive and dramatic with the craggy peaks of the Absaroka-Beartooth mountain ranges to the south and the rugged Crazy Mountain to the west. Hooks Ranch is in the Yellowstone River Valley, between Montana’s largest transportation centers of Billings (56 miles) and Bozeman (90 miles). The small town of Big Timber, located at the confluence of the Boulder and Yellowstone Rivers, is 29 miles to the west. Columbus is 12 miles to the east at the confluence of the Stillwater and Yellowstone rivers. The Billings Logan International Airport is a 60-mile drive east of the ranch and is the second-most active airport in Montana. Its airlines include Allegiant, Delta/Delta Connection, Alaska/Horizon, Cape Air and United/United Express with daily non-stop service to many US and Montana cities. Edwards Jet Center is a high-quality FBO that handles private aircraft. The Bozeman Yellowstone International Airport is a 90-mile drive west of the ranch. It is the busiest passenger airport in Montana and sixth busiest in the Pacific Northwest, serving the Greater Yellowstone region. Five airlines offer numerous daily flights. The airlines are Allegiant, Delta/Delta Connection, Alaska/Horizon, Frontier and United/United Express. They provide non-stop service to Phoenix/Mesa, Las Vegas, San Francisco, Los Angeles, Portland, Houston, Chicago, New York City-LaGuardia, Newark, Salt Lake City, Seattle/Tacoma, Minneapolis/St. Paul, Atlanta and Denver. These non-stop flights are subject to the winter and summer schedules of each of the respective airlines. Bozeman Yellowstone International Airport also has two first-class FBOs, Yellowstone Jet Center (a Signature facility) and Arlin’s Aircraft, to service private aircraft. Private aircraft up to the size of small jets are accommodated at the Big Timber Airport, or the Woltermann Memorial Airport in Columbus. Hooks Ranch is in the Yellowstone River Valley which continues through Montana almost to the North Dakota border and contains some of Montana’s most productive agricultural land along its entire length. The Yellowstone River is the longest undammed river in the lower 48 states and is as untamed as it was when Captain William Clark headed downstream over 200 years ago. The ranch’s location in the valley places it between two significant tributaries of the Yellowstone, the Boulder and Stillwater rivers, which originate in the Absaroka-Beartooth Mountains and flow north to join the Yellowstone. The snow-capped Beartooths and Absarokas lie to the south and the Crazy Mountains to the west. The nearest town is the tiny community of Reed Point, which lies on the banks of the Yellowstone River and is the home of the Great Montana Sheep Drive each Labor Day weekend. Columbus is a full-service community with a population of approximately 1,900. Columbus serves as a gateway to Yellowstone National Park, the Absaroka-Beartooth Mountains, and the Beartooth Highway, which is one of the most scenic routes in Montana. Big Timber is on the south side of the river 29 miles west of the ranch. Big Timber is a small agricultural town with a variety of overtones related to fishing, hunting and outdoor recreation that has attracted absentee owners. The Grand Hotel on the National Register of Historic Places with its attractive rooms, bar and gourmet restaurant brings many travelers off the highway and acts as a social center for many of the area residents. The ranch has extensive stock water development in addition to Schoolhouse Creek and a man-made pond that distribute livestock and support resident wildlife. There are approximately eleven drilled wells, three of which are powered by generators, and eight springs on the ranch. One well has a pipeline that feeds a storage tank. The spring-fed pond is in a very picturesque location flanked by a timbered ridge and is an attractive spot for elk and other wildlife. Annual property taxes for Hooks Ranch are approximately $2,600.00. Hooks Ranch is home to an array of wildlife. Elk are regular residents on the ranch for most of the year. As many as 200 head have been seen on the ranch, with typically huntable populations during the fall archery and rifle seasons. The area is known for producing trophy quality bulls and a 360” class bull was harvested in 2016. The trophy quality in the area is maintained because the elk roam across private lands with little to no public access and tags for branch antlered bulls are limited by special drawing. Mule deer inhabit the hills and irrigated meadows in good numbers. Whitetail deer and pronghorn antelope are also found on the ranch. Wild turkeys are commonly seen strutting on the ranch during the spring season. Upland game bird species include Hungarian partridge and sharptail grouse which find the combination of hills, native range, and hay meadows to be excellent habitat. Ducks and geese are always resident along the Yellowstone River drainage. This stretch of the Yellowstone River is relatively quiet, seeing few floating fishermen passing by. It is known by locals to have fewer but larger specimens of rainbow and brown trout. Floating the river in a drift boat or raft is a great way to enjoy the Yellowstone. The Stillwater River (approximately 12 miles east) is a spectacularly beautiful and productive trout stream. It is ideal for wading or floating and on the lower reaches. As you travel upstream the various tributaries provide substantial, but intimate, wade fishing opportunities. The Boulder River (approximately 29 miles west) is aptly named for its rocky bottom, and is a classic freestone trout stream known for its pocket water fishing. The Boulder is primarily a wade fishery, but is floatable during high water, primarily by raft. Approximately one hour from the ranch at the upper end of the Stillwater Valley is the active resort town of Red Lodge. Located at the base of Montana’s highest mountain peaks, Red Lodge is the gateway to Yellowstone Park via the spectacular Beartooth Highway. Red Lodge Mountain offers tremendous skiing with great snow, no lift lines, and a relaxed atmosphere in a gorgeous setting. The full spectrum of winter sports, including snowmobiling and cross-country skiing, is available in the nearby mountains. This part of south-central Montana was initially settled by homesteaders of Norwegian descent in the late 1800s. They came with farming in mind, but those that stayed soon adapted to utilize the native rangelands for sheep grazing. Today, raising cattle has become the business of choice for the mixed prairie grass ranges of the area. The current owner runs approximately 200 cow-calf pairs year-round. At this stocking rate, he does not produce any hay on the ranch. 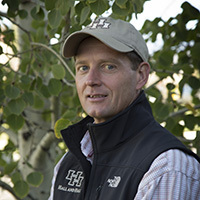 The owner rates the ranch at 160 head year-round if hay is produced on the ranch. There are approximately 300 acres that have historically been hayed, and the owner has elected to hay some of these fields in the past. Two of those fields were recently seeded in 2016 to a grass mix and one of those fields is a grass/alfalfa mix.